INCLUDED: swing, 240 lb screw eye, carabiner clip, daisy chain, and easy instructions for outdoor use or to secure to standard ceiling. Tools needed: stud finder, drill, bit, and screwdriver or metal rod to twist screw eye. Sensory stimulation - endless possible positions - hours of fun! 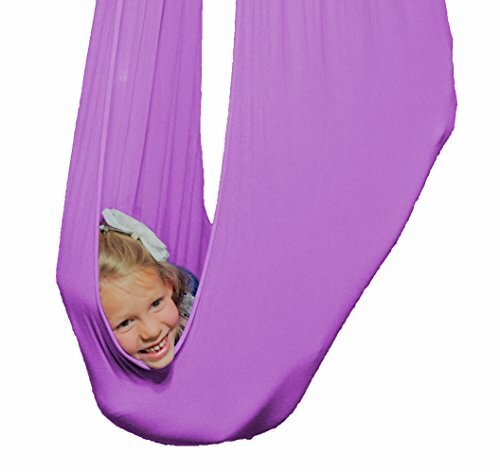 Promotes coordination and balance, strengthens muscles, and improves motor skills! Comforts and swaddles - a therapeutic experience! Our company is committed to bringing you unique products. We are confident you will be delighted with each of our sensory creations! If you have any questions about this product by SENSORY4U, contact us by completing and submitting the form below. If you are looking for a specif part number, please include it with your message.